Grosvenor Sport is a fairly new online sportsbook brought to you by Grosvenor Casinos, a massive casino brand which boasts land-based casinos in the UK and also a big online operation which services millions of customers. Grosvenor Sport now provides players with the chance to enjoy betting on the competitive odds available for sporting events. New Grosvenor Sports customers can enjoy a promotion called Double the Odds, with this being a new customer that is paid in cash. Your qualifying bet can be placed on any sport, on any market and at any odds. The maximum stake is £10 and it’s a good way of getting started with this new operator. The qualifying bet must be placed using real money in combination with the Odds Boost token. You can either choose to bet £10 as a win bet or alternatively you can stake £5 each-way and also qualify for Double Odds in this way. The extra winnings are paid in cash upon the bet settlement. Grosvenor Sport are among the bookmakers offering Cash Out to customers and this mainly through the In-Play betting facility which is powered by Kambi. The interface is similar to that of bookmakers such as Unibet, with customers being able to strike live wagers and have the chance to lock in a profit. There are live betting markets available across a range of sports on a 24/7 basis and customers simply need to place a bet and then look at their Open Bets to regard the latest Cash Out values attached to them. The Cash Out value can increase and decrease in accordance with what is happening in that sporting event. 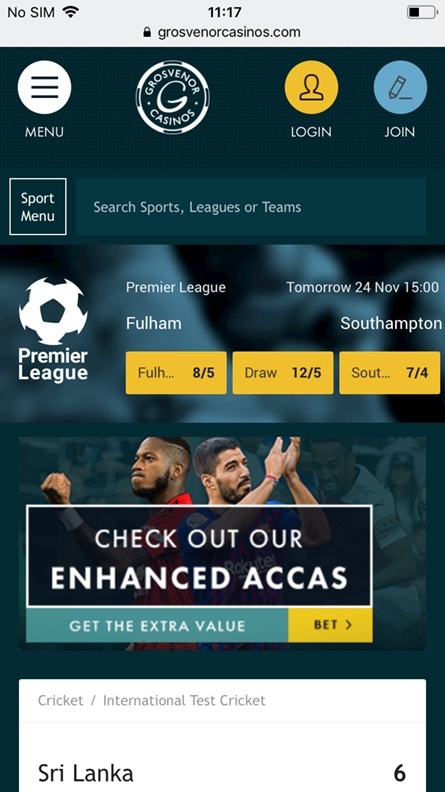 There are also Enhanced Accas available for football which allow customers to take advantage of a price-boosted multiple for the big games taking place in competitions such as Premier League, Champions League, Europa League, Nations League and La Liga. Teams are bundled together and customers can choose a price that they like. Grovenor Sport have a novel sports betting promotion available in the form of Grosvenor Goals, with customers able to play for a £1 Million prize fund and this bookmaker have hired Sir Geoff Hurst as their brand ambassador to illustrate their credibility when it comes to playing for such a large cash sum. Grosvenor Goals is a promotion which is run on a weekly basis, with customers able to select a player for each of the selected games and you can submit your picks as long as it’s five minutes before kick-off. If all of your selected ten players score the first goal, then you will win a share of the £1 million prize fund. Customers can win £10,000 if your players all score at any stage of their match, while you can also land a £10 free bet if three or more players score first, so there are excellent consolation prizes. You can also land a free £10 bet if Sir Geoff predicts four or more first scorers. 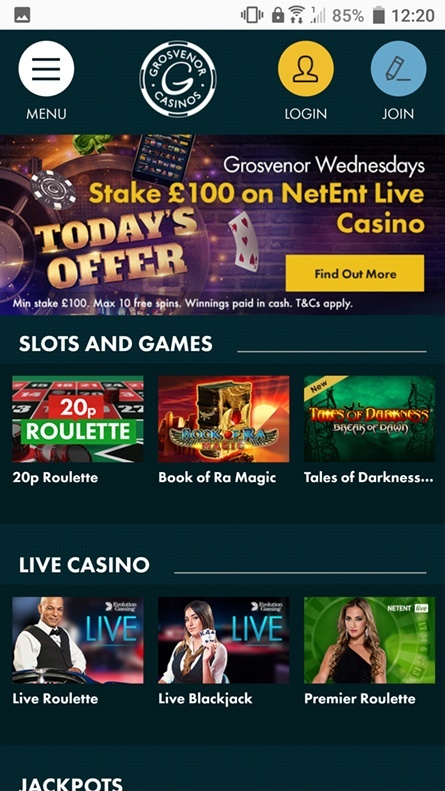 Considering that Grosvenor Casinos already had a slick app with a neat interface and excellent navigation, it’s little surprise that these hallmarks have been passed across to the Grosvenor Sport app where customers can enjoy all the best parts of being a customer including the Bet and Watch service. Indeed, we recommend downloading the Grosvenor Sport app simply to access the live horse racing stream that is available to all customers providing that they place at least £1 on the race that they want to watch. Every UK and Irish meeting is available and the bet placement will give you automatic access to streaming. The free-to-play predictor game Grosvenor Goals has recently been added and we recommend using the Grosvenor Sport betting facility when it comes to iOS or Android due to the page-loading speed and the ease with which you can log into your account and place bets. Grosvenor Sport take customer security very seriously and they also facilitate a number of payment options so that you can make a fast deposit or withdrawal when it comes to your sports betting account. The minimum deposit is £5 per transaction irrespective of your payment method. It’s pleasing to see that the ever-popular PayPal is an option for customers in addition to the standard payment methods such as Visa, MasterCard, Maestro and paysafecard. When it comes to making a withdrawal, you can expect to receive funds back in your account within 3-5 working days.